Major-General William Henry Harrision commander of the American Army of the Northwest returns to his headquarters on the Maumee River after looking for reinforcements. At once he notices that the work he had ordered to reinforce the fort has not been done. Brigadier General Joel B. Leftwich of the Virginia Militia had been left in charge of this task, but Leftwich and his men left for home the week before, as their six month tour of duty had ended. Harrison's men are now working around the clock to reinforce Fort Meigs as well as practicing their drills. The British under the command of Brigadier General Henry Proctor have landed a full force at the mouth of the Maumee River and are moving up the left bank. 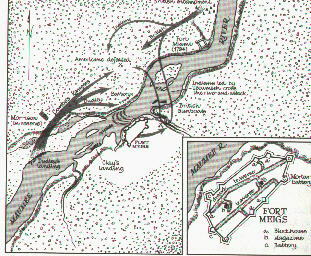 Also with the British is Harrison's old adversary the Shawnee Chief Tecumseh who has 1500 tribesmen with him and they have surrounded the American camp in the woods and are picking off soldiers when they leave the fort for water. Fort Meigs is now cut off and the Americans are out numbered two to one. Harrison's only hope is with the reinforcements from Kentucky who are still on the Upper River. Harrison's men strengthen the fort the best they can, they take down all the tents except for the one row facing the British guns. They build huge walls of earth and dig trenches and hollow out areas for the men to sit in as if they were underground. The constant rain has left the area a sloppy muddy mess. The British move into position and have built gun inplacements. It is now 11:00 a.m. on May 1st 1813 as the British guns prepare to open fire they are amazed to see the row of tents come down revealing a wall of earth helping to shield the Americans in the fort. The barrage begins, it is believed by the British that their barrage will shatter the American position. Some of the British artillery are firing "Red Hot Shot", it has a sick hissing sound as it embeds itself into the wall of wet mud. The British seem to have unlimited ammunition-huge twenty-four-pound balls of solid pig iron, smaller shot weighing twelve pounds, and bombs-heavy iron shells full of black powder, fused to explode above the heads of the defenders, spewing jagged bits of shapnel in all directions. Because Harrison is short of ammunition, his own gunners can not afford the British extravagance. They only have 360 shot for their eighteen pound cannon, about the same number for their twelves. As the British are also firing twelve-pound balls into the camp, the Major-General sees no reason why these cannot be returned. He offers a gill of whiskey to every man who delivers a ball to the magazine keeper. Before the siege is over, more than one thousand gills of whiskey have gone down the throats of the men. The British gunners are relentless and Harrison sends two men to deliver a message to the Kentucky Militia. They must send 800 men one and a half miles above the fort to attack the British guns on the left bank, spike them, cut down the carriages and return to their boats. The balance of the men are to land on the right bank of the river and fight their way through the Indians to the fort. As the message is delivered and passed along to the Kentucky commanders they do not get the order to retreat after spiking the British guns, this will be devastating to the Kentucky Militia. They leap off their boats and form into three columns, one hundred yards apart. The left column is to swing around on the flank and get behind the British guns, while Lieutenant-Colonel William Dudley on the extreme right attacks the battery from the river side. The centre column, led by Lieutenant Joseph Underwood's captain Morrison, will come up in reserve. Captain Leslie Combs will lead his company of thirty riflemen in an advance party to protect the flank. Quiety the Kentuckians move forward, the riflemen flush a small party of Indians, who after a small battle flee towards the British camp. The Kentuckians let out loud yells and attack the British batteries, the surprised British gunners flee in disorder. Dudley's men without bothering to wait for the spikes that are being sent by Harrison to hammer into the powder holes, use ramrods from their muskets to render the cannon useless. At this point everything Harrison had hoped for has been achieved. The guns have been silenced before Proctors reinforcements can be brought forward or the Indians on the other side of the river can cross. It is time to retire but Dudley's men do not know this. They stand around the useless guns, confused and disorganized, cheering themselves hoarse. Harrison watching from the fort signals for them to return, but the troops believe the General is cheering them on and so they cheer back. As time goes by more and more Indians appear on the fringe of the woods bordering the open plain where the British guns are placed. The Kentuckians tear after the Indians who slowly draw them into the woods farther and farther away from the protection of the plain. Harrison is horrified, "They are lost! They are lost!" Can I never get my men to obey orders? he cries out loud from where he is watching. A small force of British counter attack trying to retake the cannon they are surprised to see the Americans give way, they do not yet know that Tecumseh has swum across the river and sucked the left flank of the American force into the maze of forest. As the Kentuckians stumble forward, mauled by the elusive native sharpshooters withdrawing behind logs and stumps, Tecumseh circles behind them. Caught in an ambush, the green troops are driven back toward the advancing British, trapped between the two fires. The retreat becomes a rout. The Kentuckians rush back through the woods towards the batteries, where they feel they can re-form and repel the Indians. The men are dropping all around, of the 800 hundred Kentuckians who landed and attacked the British guns fewer than 150 have escaped. Procter, because his cannon are now useless has no choice but to raise the siege and return to Amerstburg. Both commanders in their official reports put the best possible face on the battle, overestimating their adversary's strength as well as his losses and minimizing their own. Proctor writes to Sir George Prevost that he believes the enemy's casualties to have been between one thousand and twelve hundred. Harrison assures Armstrong that no more than fifty Kentuckians have been killed and that he has reason to believe that many have escaped up river to Fort Defiance. As a result of Proctor's report, Prevost's General Order announces "the brilliant result of an action which took place on the banks of the Maumee River, which terminated in the complete defeat of the Enemy and the capture, dispersion or destruction of 1300 men by the gallant division of the Army under the command of Brigadier General Proctor. Harrison in a simlar General Order, issued about the same time, "congratulates the troops upon having completely foiled their foes and put a stop to their career of victory which has hitherto attended their Arms. He cannot find words to express his sence [sic] of the good conduct of the Troops of every description and of every corpse [sic]." "It rarely occurs that a General has to complain of the excessive ardor of his men yet such appears always to be the case whenever the Kentucky Militia are engaged. It is indeed the sorce [sic] of all their misfortunes. They appear to think that valor alone can accompplish anything, Such temerity although not so disgraceful is scarcely less fatal than cowardice.